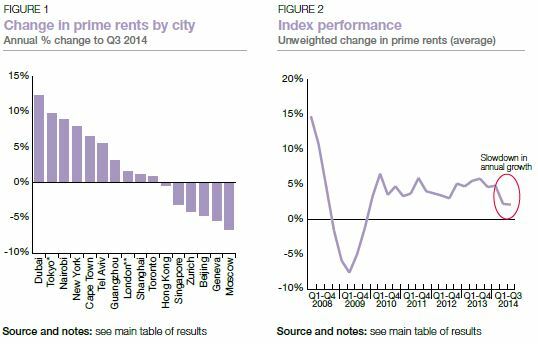 Although our Prime Global Rental Index increased by 2.1% in the year to September 2014, its rate of annual growth has slowed considerably. Kate Everett-Allen assesses what’s behind the slowdown. An annual rise of 2.1% in the 12 months to September represents the index’s weakest rate of annual growth for almost five years. Dubai holds the top spot for the second consecutive quarter, recording a 12.4% increase year-on-year. However, the rate of rental growth in the Emirate is slowing with no change recorded in prime rents in the three months to the end of September. 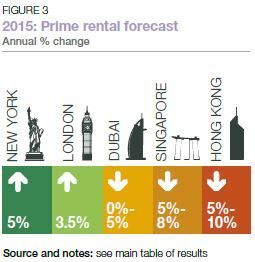 Prime rents in both Tokyo and New York accelerated over the 12 month-period, by 9.8% and 7.9% respectively. Japan, having voted this week for a second term of Abenomics, may – if Prime Minister Abe’s monetary stimulus measures prove successful – start to be the target of more multinational relocations boosting prime rents further. The index’s overall slowdown becomes apparent when the results are compared year-on-year. In the year to September 2013 nearly 90% of the cities tracked saw prime rents increase on an annual basis; this figure has now shrunk to 66%. Luxury rental demand is firmly linked to demand from corporate tenants and hence business sentiment. With the global economy stuttering in 2014 business sentiment has dipped, indeed Markit’s Global Business Outlook Survey is now at a five-year low. Concerns over a renewed downturn in the Eurozone, a potential interest rate hike in the US and the UK as well as tension in Ukraine and the Middle East are weighing on economic confidence. Of the 16 cities tracked, New York continues to command the highest luxury rents in real terms with a typical two bedroom apartment in Manhattan available at around US$8,000-US$8,500 pcm. London and Moscow sit in second and third place with prime rents around US$6,500-US$8,000 and between US$6,000 and US$7,000 pcm respectively. Prime rental markets often move in the opposite direction to the sales sector. 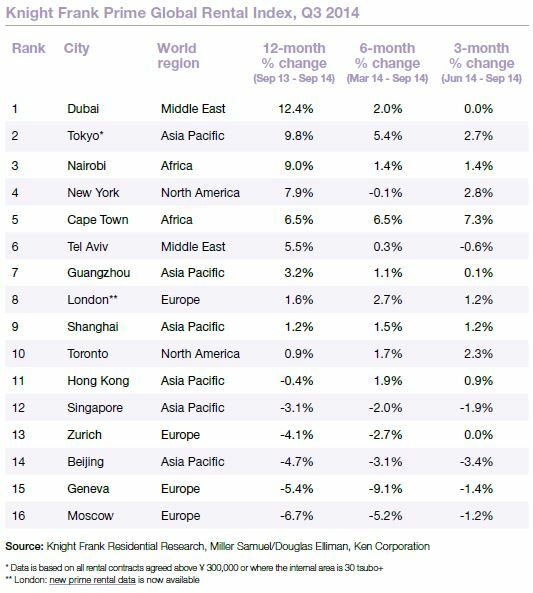 With the luxury sales market now the target of both cooling measures (Asia) and a changing tax landscape (UK, US, France) we expect the Prime Global Rental Index to strengthen in 2015 with London and New York leading the way (figure 3). The Knight Frank Prime Global Rental Index is an important resource for investors and developers looking to monitor and compare the performance of prime residential rents across key global cities. Prime property corresponds to the top 5% of the housing market in each city. The index is compiled on a quarterly basis using data from Knight Frank’s network of global offices and research teams. Knight Frank LLP 2014 - This report is published for general information only and not to be relied upon in any way. Although high standards have been used in the preparation of the information, analysis, views and projections presented in this report, no responsibility or liability whatsoever can be accepted by Knight Frank LLP for any loss or damage resultant from any use of, reliance on or reference to the contents of this document. As a general report, this material does not necessarily represent the view of Knight Frank LLP in relation to particular properties or projects. Reproduction of this report in whole or in part is not allowed without prior written approval of Knight Frank LLP to the form and content within which it appears. Knight Frank LLP is a limited liability partnership registered in England with registered number OC305934. Our registered office is 55 Baker Street, London, W1U 8AN, where you may look at a list of members’ names.